Opened in 2012, The Bodhi Tree Salon & Spa is one of a rare few in Northwest Arkansas to carry the high-performing, plant-based line of Aveda products. Owner Julie Moore has dedicated her life to pampering others and gave us a glimpse into her holistic approach to beauty and wellness. After completing beauty school in her 20s, Julie worked at a salon that used a more natural, plant-derived product with their customers. That experience aligned with Julie’s personal values and set the stage for her own #salongoals...but more on that later. Julie has remained in the salon business for nearly 30 years now. 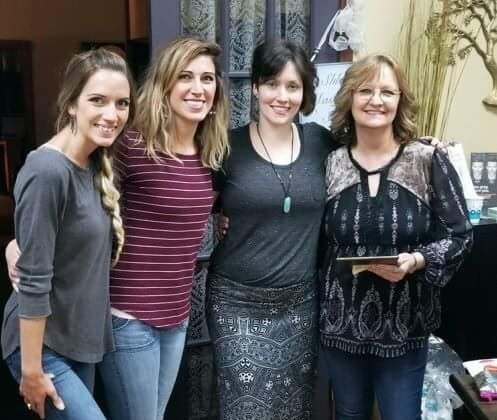 After spending 20 of those years at her own salon over in Harrison, Arkansas, she moved to Fayetteville to be closer to family. Rather than make the hour and a half commute to Harrison to continue working there (can you blame her? ), Julie took a leap of faith and decided to open up Bodhi Tree Salon & Spa. The Bodhi Tree, as some may know, is most famous as the tree under which Buddha meditated and became enlightened. As an admirer of the peaceful nature of Buddhist philosophy, Julie thought that “Bodhi Tree” had a calming vibe that also aligned with her dedication to more natural salon products. Though Julie has always strived to use more natural products in her salons, it wasn’t until she opened Bodhi Tree that she was finally approved to carry the Aveda line of botanically-based goods. Bodhi Tree Salon exclusively uses Aveda's color line, facial products, and body + skincare products. Because the salon staff aims to provide holistic products for the body, they refrain from performing any chemically-toxic services...basically anything that smells bad. Why is this so important to Julie? For one, she has personally always ascribed to a more natural lifestyle, medically and in personal care. She wants to share those kinds of natural services with others and make them more available to the public through her business. Not only is Bodhi Tree Salon fully committed to providing natural beauty services to their customers, they also love to PAMPER. Take a seat at Bodhi Tree and you’ll be met with all kinds of extra spa services that would typically come at an additional cost. Whether you’ve come for a hair cut or massage, don’t be surprised to be treated to a hot towel or aroma therapy–and at no extra cost to you. Just as a tree requires fertile soil and the right nutrients, the Bodhi Tree Salon has grown only with the help of many moving parts. Julie planted the seeds but it has been the work and passions of her entire team that have helped the salon sprout and take shape. Kimberly says she’s just always been a people person and her various jobs throughout her career have given her plenty of face-to-face time with customers. She joined Julie’s team almost two years ago now. When she learned about the salon’s commitment to a more natural lifestyle, her interest was piqued. “I already used the same kind of products in my own life,” she explains. Julie loves her girls, and we’re certain you will too. After all, they’ve got a hot towel and a scalp massage waiting for you at Bodhi Tree Salon & Spa. And we’ve got some special perks waiting for you on the Towny app (for FREE)! Download today!